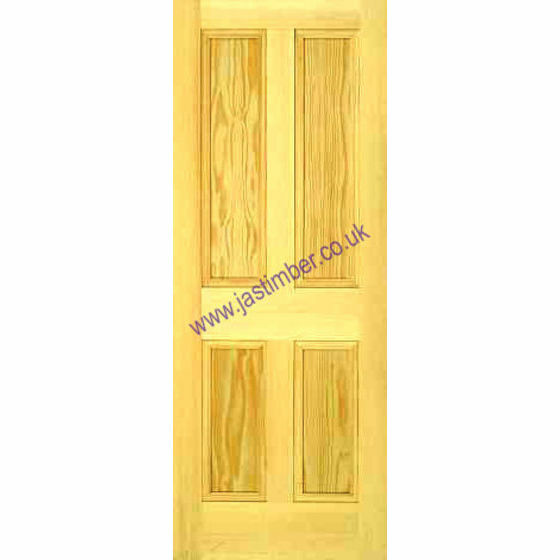 Flat Panel Pine Fire doors at affordable prices. Traditional Pine Door designs with Flat Panels. Solid engineered Pine construction with MDF-core panels; Islington FD30 Flat 4 Panel Edwardian solid panel door design from the last century. - 78x27", 78x30", 78x33" & 80x32" Islington 4-panel FD30 Firecheck Doors must be treated to manufacturer's instructions. - We cannot be held responsible for any variations in manufactured Mendes Fire Door sizes, pattern, construction, grading, moisture content, treatment, certi­fica­tion, knots, colour or grain. - It is the purchaser's respon­sibility to check the suitability of their FD30 or FD60 Mendes Fire Door and it's Certi­fica­tion, in conjunction with Intumescent Strip, the Fire-Door Frame with Architrave, the Fire-Door Panic-Hardware and the Fire-Door's Situation of Use. ( Waxes, oils, varnishes or water-based woodstains are NOT suitable. Maximum size reduction on fitting is 3mm per edge for Standard Mendes Fire Doors, It is often possible to cut more off a door, but this is at your own risk, and may contravene the Fire Certificate. Fire door Certification may not be valid after any cutting, or if apertures are inserted, unless work is carried out under the BWF Certifire scheme; Check with your Building Inspector or Fire Officer. - We cannot exchange Pine Islington Fire Doors after order - Mendes Islington FD30 Pine Fire Doors are supplied as a Special Order. Direct Delivery - Direct to Site Islington FD30 Pine Fire Door Delivery Details from PM-Mendes Doors - PM-Mendes quote up to 2 weeks from order, so long as the doors are in stock. Carrier Delivery of Mendes Pine Fire Doors is not possible. E. & O.E. see T&C - We do try to keep prices and specifi­cations of Mendes Pine Fire Doors correct, but mistakes can be made! Please let us us know if you do spot any errors - thanks.